....I love this scene from "Elf"
On Sunday we were wearing t-shirts on the boat. Yesterday morning (and this morning) we had a freeze! Due to the cooler temperatures, I decided to make hot chocolate. This recipe uses a paste. Let me show you what I mean! Literally, it's the consistency of toothpaste. 2. Heat milk either on the stovetop or in the microwave. I heat mine in the microwave in a glass measuring cup for 1 minute 45 seconds to two minutes. 3. Stir warm milk into paste. This also requires several stirs. 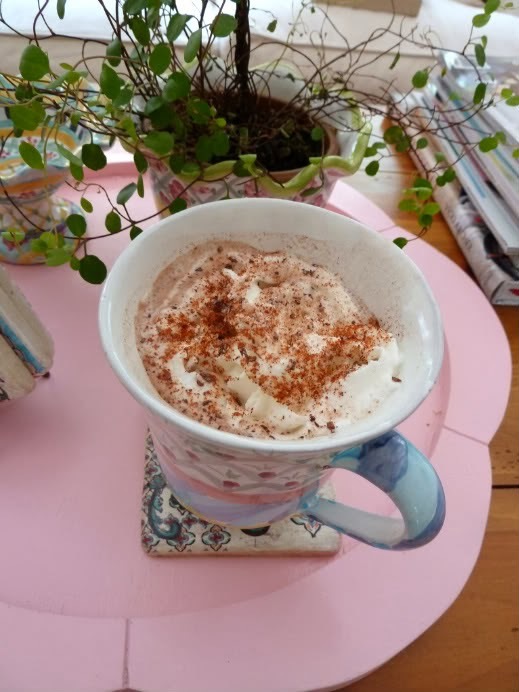 My daughters' favorite recipe is Mexican Hot Chocolate. Mix chocolate, sugar, milk, and salt in a two quart sauce pan over medium low heat until the chocolate is melted and the ingredients are well blended. Add vanilla. Pour hot chocolate into mugs. Garnish each with two or three tablespoons whipped cream, and two pinches each of chipotle chili pepper and ground cinnamon. I hope you're keeping warm today! Monday we stopped into a gift shop and they had a unique chocolate with chili in it. Hubby LOVED it. It's not to be used in hot chocolate, but rather a bar of chocolate to eat. Just thought I'd mention it... bet the hot chocolate was good spiced up like that! That sounds wonderful! Our weather did the same thing, by the way. My plants are gone now. Oh this looks sooo wonderful. I think our cold weather has caused me to get a cold. I am curled up by the fire today and working from home. This is on my to do list ...for sure. Oh yum! Now I need a big mug o' hot cocoa STAT!!!! :) Thanks for sharing the recipes!! Hershey's special dark is awesome. I use it for a quite a bit of Christmas baking. Excited to try this cocoa recipe. Ah, I really want to try that Mexican Hot Chocolate! YUM! And your first recipe looks fantastic too! Oh, that cup of hot chocolate looks inviting. I am having a relax at home day after teaching at a middle school leadership conference yesterday. My body is no longer used to standing all day and using my voice. The cocoa should soothe my throat. oh lawd, I need to try that Mexican hot chocolate!! I would love a cup of either cocoa right now! Although it is warning up for the weekend. mmmm, your girly has good taste!!! I am a hot chocolate addict. I like to try new varieties but usually fall back on my usual, Nestles Quik. I think I would pass before trying the Chili powder. That's the way my grandmother always made it -- love that! I was wearing long-sleeve tees last week and even my sherpa-lined boots one day (actually, that was kind of a stretch), and this week we've had the air back on -- ugh! I adore hot chocolate Ricky and your Mexican récipe sounds yummy! Just before my last post I have Ecuadorian récipe from scratch made out of the 'real' chocolate Tablet...there are amazing chocolate around these parts too. Thank you for your sweet and kind visit lovely lady, you made my day! Oh my my! 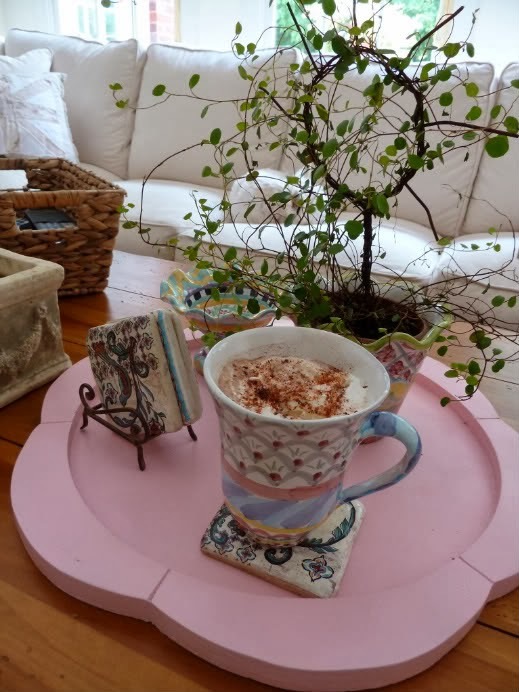 Your hot chocolate looks wonderful!! I used to make hot chocolate for my kids and haven't made it in years. That paste looks like it would be amazingly wonerful! It feels like winter up here in Ohio. Cold and windy. Almost all the leaves are down. Have a lovely weekend Ricki Jill!